The native plant communities in central California evolved with periodic fires that would remove dead wood and dead leaves, trim lower branches and generally thin out the plant community. 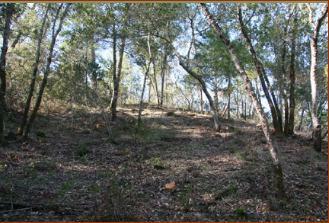 In the oak woodland, these would have been light groundfires that would not have killed established trees. The light periodic fires suppressed plants that are sensitive to fire, such as California bay and poison oak. This resulted in a more open oak woodland, with more light reaching through the canopy. The forest floor was open and uncluttered, allowing herbaceous plants to proliferate and flourish. Perennial grasslands needed fire to flourish. Without fire, the bunches gradually become choked with dead leaves, and the grasses decline in vigor. Periodic wildfires remove the dead foliage and help the grasses to become more vigorous. As a society, we have suppressed wildfire in order to protect our homes and structures. The result, however, is an oak woodland with a far higher density of trees than would have been found in the past. The forest floor is now covered with heavy accumulations of dead wood and leaves. There are herbaceous plants, and greatly reduced habitat for wildlife. The lack of fire has allowed the accumulation of great quantities of fuel, creating a dangerous wildfire hazard. It has also allowed the proliferation of California bay, which has aided the spread of Sudden Oak Death. This hillside was formerly covered with dense brush and poison oak. A Pacific OpenSpace crew cleared the old brush, and left most of the oak tree overstory along with the herbaceous perennials and some shrubs. Over time, we will thin the forest again to let the remaining trees grow large and full. We will maintain the other vegetation so that this woodland will become even safer from fire, as we also improve the habitat value and aesthetic appearance.